Bezeq, the largest Israeli telco has launched a new fiber optic network – the NGN. Though the event is not exactly belongs to the mobile world, I think it may have significant and long lasting effects on the whole Israeli communication market, so it worth to say a few words about it (especially due to the fact I had a chance to visit the public launch event and even shot a a few pics there). over the time. The first question has got a partially positive answer by now – for example 2.5 Mbps package price has been reduced; yet it still has a long way down IMHO. The more complete answers to these questions will be seen later when the NGN infrastructure will reach the majority of population (by 2010). Now to the launching event. It was widely promoted on the national TV and was present on outdoor billboards. 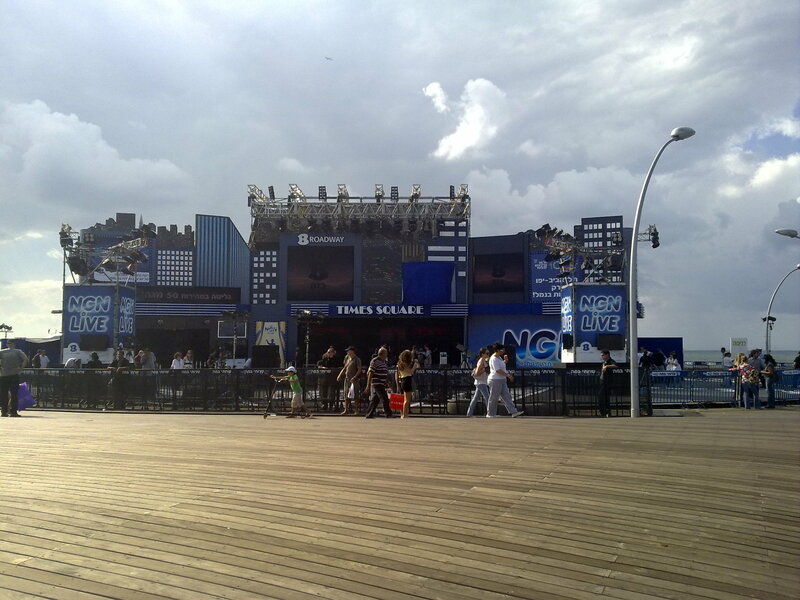 The promos promised some kind of ‘happening’ and a demonstration pavilion in the old Tel-Aviv harbor compound. The open-air ‘happening’ featured a stage with various activities for families and performance of local artists. 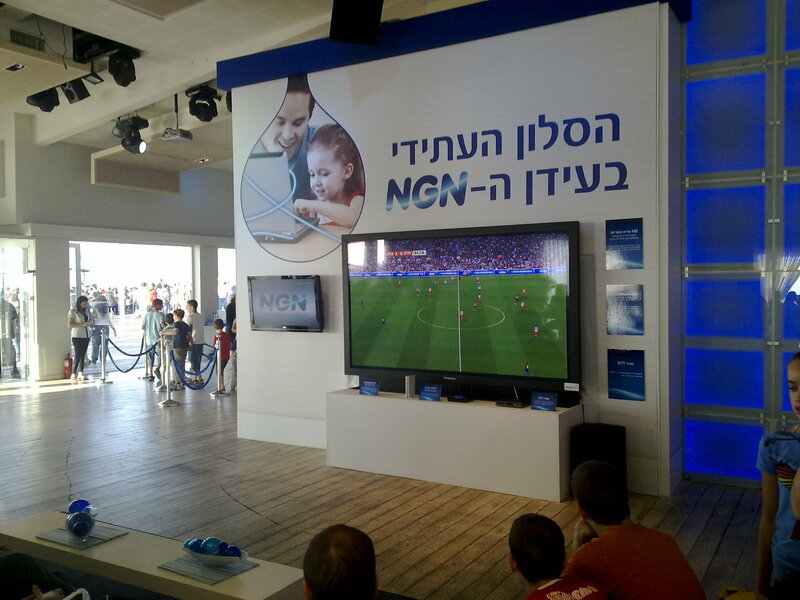 It has clearly demonstrated that Bezeq is interested to penetrate with the service directly to the mass market skipping the stage of tech fans and early adopters. The demonstration pavilion was a bit disappointing. It featured a few areas. Close to the entrance were placed netbooks which allegedly had to show the superior speed of NGN. 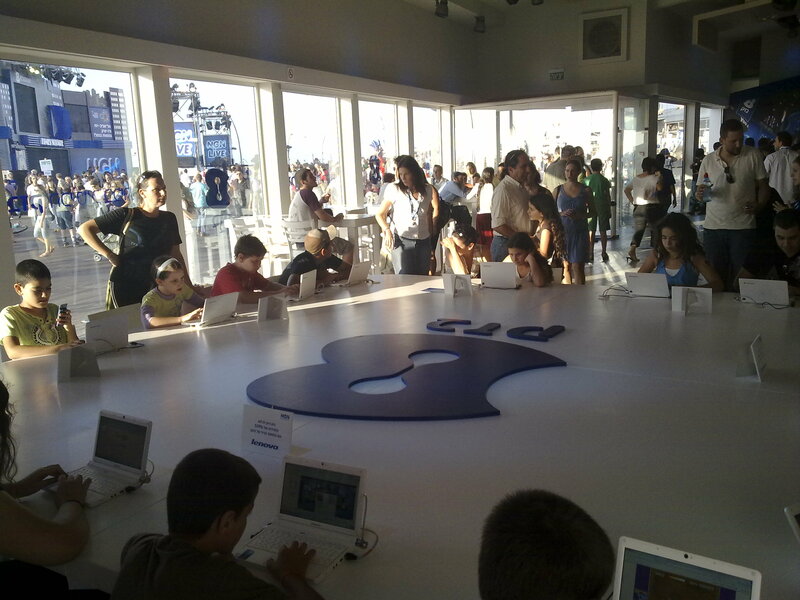 In practice there were no installed application which were able to demonstrate it and the netbooks were conquered by children surfing the Facebook. Another area demonstrated ‘the living room of the future’ showcasing a streaming HD picture of a soccer game. Bezeq staff was absolutely proud of the streamer box and willingly explained how the streamer is connecting wirelessly to the router and transmitting the picture to the TV without any PC. Additional compound showed the new services launched by Bezeq which not exactly depend on NGN. Among the services are IP-telephony (which is already operational but can only be connected to a PC but not to IP-phone). The pricing of the service is similar to a regular phone line. Another service is file storage. 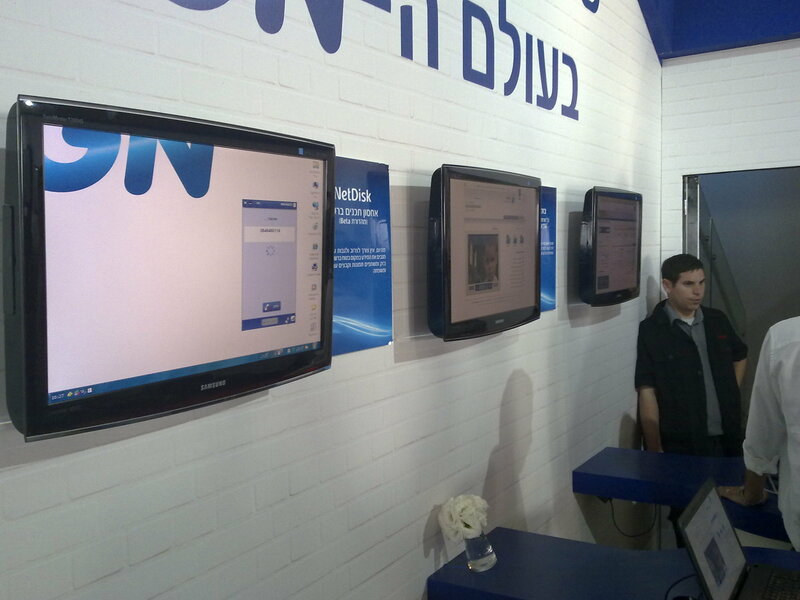 It’s unclear to me which target is pursued by Bezeq in launching this service. It is similar to many free web storage service but unlike them it costs money. In addition, the file size is limited to 50 MB only. On my question what makes the service unique, Bezeq staff answered that it has a Hebrew user interface and that it is more reliable that regular web freebies. 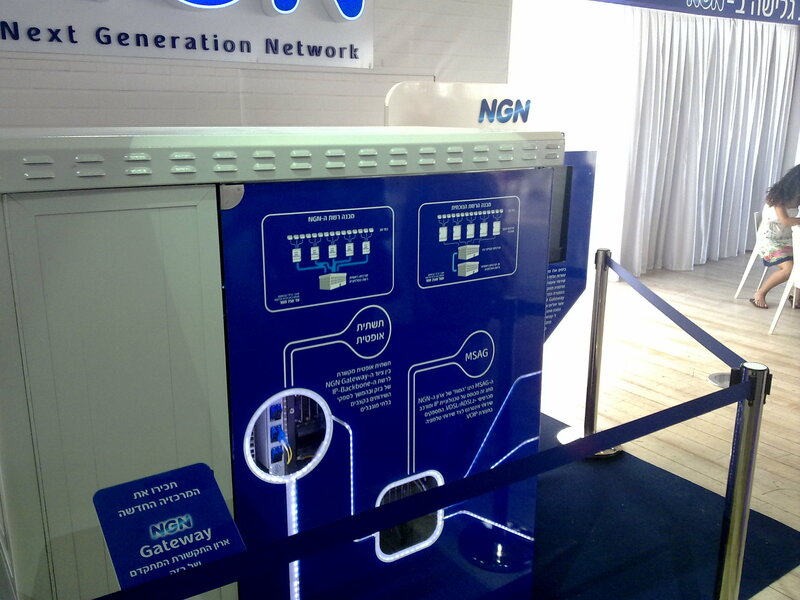 The last mention worth item was a model of the NGN gateway box. It was explained that one such box can serve up to 500 households and this is the final point of the fiber optic. The box connects to the old copper wires which can’t be longer than 70 meters. I’ve also asked whether Bezeq is planning to provide content for high connection speeds. They said that in the short run they are only going to offer ‘light’ content such as ringtones and there is no intention to become a content provider. In my view though, the key question is will Bezeq receive regulator’s permission to provide IPTV services and what will happen in this case with Bezeq affiliated YES satellite TV company. If IPTV platform will be launched satellite broadcasting will become unnecessary and is likey to be shut down. However this is a matter of too distant feature. Now, discussing the consequences of this launch and taking into consideration that HOT cable company is about to start similar service in a short time, it’s obvious that mobile carriers will have to upgrade their speed too if they want to continue the trend of the recent years of positioning themselves as leaders of the communication market. This raises the question whether the carriers are ready to invest in LTE and acquire additional frequencies for it. There is no doubt though that the launch of NGN network was critical for Israel as after being a leader in communication field, in the last few years it has been left behind not only by the futuristic 🙂 countries such as Japan and S. Korea but also by many European countries. You are currently browsing the archives for the bezeq category.